Swiftic offers the perfect mobile app solution for any business. As a Swiftic member, you enjoy unlimited access to all the features you need to connect with your on-the-go customers, grow your business, and build lasting loyalty in an ever-evolving mobile age. You can purchase a Monthly, Yearly, or 2-Year subscription. What does your subscription include? Unlimited app downloads. Let an unlimited number of customers install and use your app. Unlimited push notifications. Contact your customers anytime, from anywhere, and as often as you like. A native iPhone and Android app. Your app is completely compatible with iPhone, iPad, Android phones, and Android tablets. Unlimited access to the Help Center. Here you’ll find comprehensive articles and instructional videos to assist you with building, designing, publishing, and managing your app. Email support. Need help? Contact our dedicated success team! App publication assistance. Our app store team will help with everything from opening your developer accounts to submitting and securing the approval of your app on the Apple App Store and Google Play. Read more about the app submission process. Over 25 profitable features. Pick and choose the perfect features for your business. Don’t forget to use our loyalty-enhancing favorites: Coupons, Loyalty Cards, Call Us, Email Us, and Forms. A mobile app store. Sell products directly through your app 24/7, using a secure and instant PayPal checkout. A full promotional toolkit. It’s chock-full of free goodies like QR stickers, banners, promotional emails, and more to help you promote your business and app. Advanced app analytics. Track the success of your app and see which features your customers love the most. User-friendly editing tools. Update and edit your app easily, anytime you want. Note: Plans are per app. 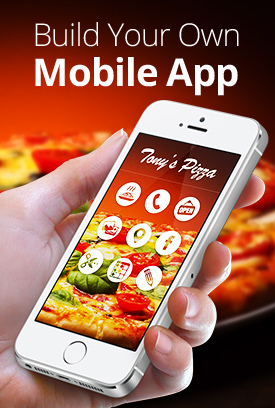 All of the features included in the plan are applicable to one app only.